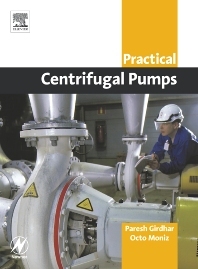 Practical Centrifugal Pumps is a comprehensive guide to pump construction, application, operation, maintenance and management issues. Coverage includes pump classifications, types and criteria for selection, as well as practical information on the use of pumps, such as how to read pump curves and cross reference. Throughout the book the focus is on best practice and developing the skills and knowledge required to recognise and solve pump problems in a structured and confident manner. Case studies provide real-world scenarios covering the design, set up, troubleshooting and maintenance of pumps. Paresh currently works mainly in the rotating equipment field focussing on the petrochemical and polymer industries. He has considerable interest in maintenance management as well. His current field of activity encompasses condition monitoring, reliability enhancement, troubleshooting of rotating equipment which includes special purpose steam turbines from manufacturers such as ABB and GE and multistage centrifugal compressors (Elliot). He has also spent a considerable part of his career working with all types of fans, compressors, pumps, extruders, general purpose steam turbines, engines and motors. He has contributed extensively to IDC Technologies books on centrifugal pumps and vibration analysis. Octo Moniz is an experienced Mechanical Engineer with 20 years industry experience in operations, maintenance and management of a diverse range of plant and equipment in a marine environment as well as onshore based installations. Octo’s broad knowledge stems from his vast experience, and his enthusiastic manner when presenting his workshops has made him one of IDC Technologies most sought after instructors in the area of pumps. Many of Octo’s past delegates have commented on his enthusiasm and specialist knowledge of this topic when applied to Australian conditions. Senior Hospital Engineer for the Government of Western Australia Perth, Australia.